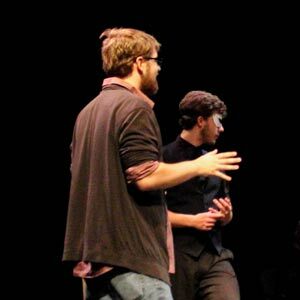 The Director's Festival features student and faculty directed One Act plays from 10-50 minutes in length performed throughout a week of adjudicated evening performances. The Director's Festival culminates in a final night of selected performances on Saturday, June 25, 2011 (Best of Fest). Best of Fest admission is free upon presentation (at the door, doors open at 6:30pm) of a non perishable canned food item. <br><br> Monday, June 20st at 8:00pm:<br> -The Couch Play by Melissa Girard, directed by Jeremy Hohn<br> -Dr. Hack Moves In by Ken Parks & Frank Maciel, directed by Michael Ornelas<br> -The Man of Infinite Sadness, by Brian Tanen, directed by David Anis<br> <br> Tuesday, June 21st at 8:00pm:<br> -Wildwood Park by Doug Wright, directed by Adina Vaughan<br> -Oprah Made Me Do It by Bradley Hayward, directed by Julian Vazquez<br> -Spanish Fly by Maureen Medved, directed by Chuck Ketter<br> -Color Blind by Ishmon Brown, directed by Ishmon Brown<br> <br> Wednesday, June 22nd at 8:00pm:<br> -Beached by Bernie DeLeo, directed by Matt Grisat<br> -SnowAngels by Lewis John Carlino, directed by Kayla Kimmel<br> -So I Killed a Few People... by Gary Ruderman & David Summers, directed by Misty Blue Bivens<br> <br> Thursday, June 23rd at 8:00pm:<br> -La Llorona Llora by Silvia Gonzalez S., directed by Peter Kuo<br> -Another Way Out by Lawrence Langner, directed by Michael Ornelas<br> -Woyzeck by Georg Buchner, directed by Stephanie Grace Cyrkin<br> <br> Friday, June 24th at 8:00pm:<br> -The Thread Men by Thomas C. Dunn, directed by Matt Grisat<br> -The Recyclers by Terry McNicol, directed by Terry McNicol<br> - L.A. Lights Fire by Eric Czuleger, directed by Jonathan Infante<br> <br> Saturday, June 25th at 7:00pm:<br> -Best of Fest final night of selected performances. FREE Admission with the donation of a non-parishable food item. Sorry the images for this performance are not available yet. More Information. A perfect day in NYC with our @fullcoll theatre students. #dfest2019 #newworksfeatival #studentplaywrights #studentdirectors cclasby@fullcoll.edu for more information Applications Due April 29th! Announcing the Fullerton College Theatre Arts Department Fall 2019-Spring 2020 season. Advanced Acting Devising Masterclass with Jenni-Lynn Brick from @theatermitu. Expanding perspectives and telling powerful stories. Last weekend to see #premiere of #DisasterTheMusical at #GemTheatre #gardengrove #studentrush tonight $20/studentID #dontmissit #hilarious musical. Fullerton College Visual and Performing Arts updated their cover photo. Fullerton College Visual and Performing Arts shared a post. The Grand Finale for a sold out performance! Join us again next Spring! Each season of plays provides a wide variety of roles and production post experiences for Theatre students. High production values, current state of the art technologies, and a wide spectrum of very challenging styles and subject matter make the performance venues excellent laboratories for student exploration and growth. Few community colleges offer students opportunities to study directing and playwrighting in their first two years of undergraduate study. Students follow the classwork they successfully complete with opportunities to compete for assignments in the Playwrights Festival and the Directors Festival. For both the non-major and the major alike, the Theatre Arts general education courses meet university transfer requirements and allow the student to build a strong foundation of introductory knowledge to the many facets of theatre-making and theatre-study. 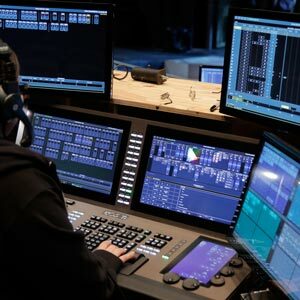 Fullerton College offers an extensive array of courses in theatre production and design, professional training certificates, and access to the latest technologies and practices used in the entertainment industry. Performance will run approximately with no intermission. The Box Office is closed for the Holiday today. The Box Office will reopen on Monday, April 22nd at 9:30am for the normal hours of Monday through Friday 9:30am to 3:30pm. Tickets are only available for this event only at the Bronwyn Dodson Theatre Box Office starting one-hour prior to the event. Sorry this performance of Directors Festival is sold out. A wait list will be made available starting one-hour prior to the start of this performance. You must show up in person to place your name on the list during this time. For an additional fee of up to $2.00 per ticket, you may purchase tickets through the third-party vendor EventBrite. Sorry this performance of Directors Festival is not on sale yet. Most performances go on sale no less than four weeks before the production begins. That you are leaving the Fullerton College domain and entering the third-party website Eventbrite. Eventbrite acts as Fullerton College's ticketing agent solely for the purpose to collect payments made by attendees with respect to such event hosted at Fullerton College. By continuing to the Eventbrite site you are agreeing to their terms of service as outlined on the Eventbrite site. Any topics or concerns related credit card charge disputes or customer data security are solely between the purchaser and Eventbrite and not the responsibility of Fullerton College or the North Orange County Community College District. Tickets purchased on Eventbrite are non-refundable and non-exchangeable. Tickets offered on Eventbrite encumber an additional fee of up to $2.00 per ticket above the advertised face value of the ticket. Additionally, once the transaction with Eventbrite is complete you will receive a traditional paper ticket to this event from the Fullerton College Box Office not Eventbrite. Tickets purchased less than one week before the event will be placed at will call for pickup. Tickets purchased greater than one week will be postal mailed. No print-at-home or other any other electronic generated copies will be accepted at the point of entry to the event. If the aforementioned terms are unacceptable, a purchaser may alternatively obtain tickets to Fullerton College events by either telephone 714-992-7150 or in person at the Fullerton College Box Office window. A play that has only one act, as distinct from plays that occur over several acts. One-act plays may consist of one or more scenes. With an emphasis on providing directing opportunities for our students, alumni, and staff, The Resident Theatre Company's Directors Festival continues the Theatre Arts Department's promise to provide all who are interested the opportunity to participate in the creation of live theatre. Professionals, amateurs, mentors and students are all welcome to this experimental forum for directors. The guidelines are simple-a project must be no longer than 50 minutes, it must be able to be set-up and taken down in less than ten minutes, and it must utilize only one lighting special. The rest is up to the ingenuity, resourcefulness, and imagination of the director and his/her collaborators. A distinguished panel of critics and theatre professionals adjudicates projects. The artistic directors, considering the input from the critics, choose the projects to go on to Best of the Fest, which follows on the Saturday night of Festival week. The Bronwyn Dodson Theatre, a black box theatre, named after former student Bronwyn Dodson, can accommodate up to 150 audience members. A flexible seating systems allows for proscenium, thrust, semi-thrust, arena, and alley configurations to the theatre. One half of our season, the Playwrights Festival, Directors Festival, and class projects perform in the Bronwyn Dodson Theatre. Our wheelchair accessibility section is located in the first row at ground level. Additionally, most seating requires the navigation of a few steps per aisle. Check in with the lobby staff upon arrival for assistance with either of these needs. When purchasing tickets please let our Box Office staff know of any accessibility needs. Located inside the 1300 building on the southwest side of the college campus. The entrance to the theatre is located inside the patio area found on the east side of the 1300 building. Available at the Bronwyn Dodson Theatre Box Office, located adjacent to the main entrance. We will open starting one hour before the start of the performance and close with the start of the performance. Please note that the telephone is not answered during this period. Do you have any questions, comments or concerns about Directors Festival ?. Please fill out the form below and someone will return your inquiry shorty. Alternatively, you can call us at 714-992-7150 the next time we're open. The Box Office is closed for the Holiday today. The Box Office will reopen on Monday, April 22nd at 9:30am for the normal hours of Monday through Friday 9:30am to 3:30pm. The Fine Arts Division is currently in the process of organizing the digital files of our previous productions. We are moving in reverse chronological order, however, are happy to accommodate a particular production the community may be interested in viewing. You may make a request below to have a particular production placed next in the archival queue. We will subsequently notify you when it is complete. Thank you. Please notify me when the images and/or program from the production of Directors Festival becomes available.